America, Canada and Mexico cheered their new, if little-changed, trilateral pact. But U.S. officials also noted that steel and aluminum tariffs remain. And the White House wants to pick which carmakers are subject to import duties. Taxing trade is in full swing. U.S. President Donald Trump, Canada's Prime Minister Justin Trudeau and Mexico's President Enrique Pena Nieto attend the USMCA signing ceremony before the G20 leaders summit in Buenos Aires, Argentina on November 30, 2018. 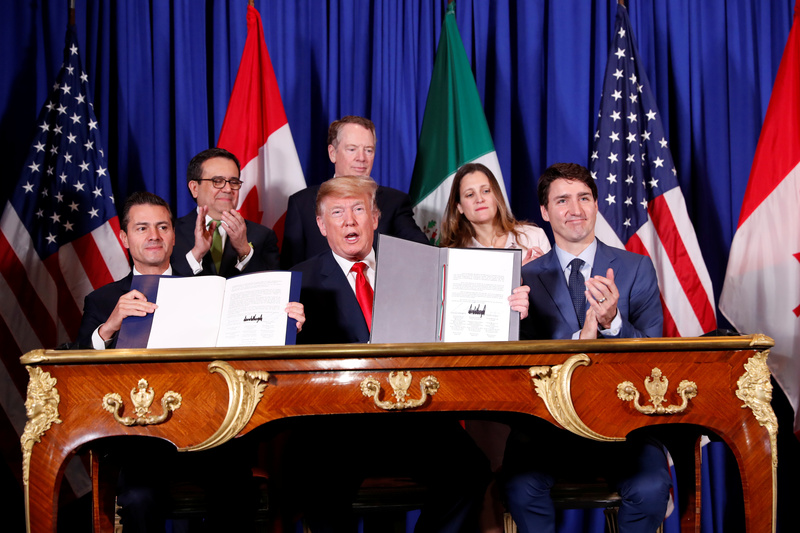 U.S. President Donald Trump, Canadian Prime Minister Justin Trudeau and Mexican President Enrique Peña Nieto signed the United States-Mexico-Canada Agreement during the G20 summit in Argentina on Nov. 30. Before the signing, Trudeau told Trump in public remarks that U.S. tariffs on steel and aluminum need to be removed. In a side pact, Canada and Mexico will be allowed to export a certain number of vehicles to the United States that are exempt from potential U.S. auto tariffs. The White House wants to choose which carmakers exporting from Mexico are subject to those auto import duties, according to The Globe and Mail.